"A work of courage and ferocious honesty" (Diana Abu-Jaber), Double Bind could not come at a more urgent time. Even as major figures from Gloria Steinem to Beyoncé embrace the word "feminism," the word "ambition" remains loaded with ambivalence. Many women see it as synonymous with strident or aggressive, yet most feel compelled to strive and achieve—the seeming contradiction leaving them in a perpetual double bind. Ayana Mathis, Molly Ringwald, Roxane Gay, and a constellation of "nimble thinkers . . . dismantle this maddening paradox" (O, The Oprah Magazine) with candor, wit, and rage. Women who have made landmark achievements in fields as diverse as law, dog sledding, and butchery weigh in, breaking the last feminist taboo once and for all. 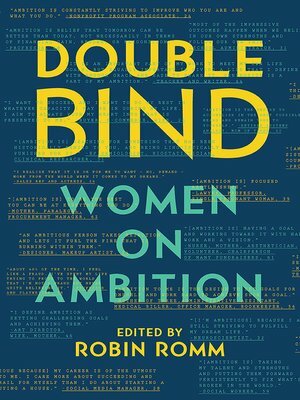 "Both intimate and scalable" (Atlantic.com), Double Bind finally seizes "ambition" from the roster of dirty words. Robin Romm is the author of The Mother Garden and The Mercy Papers. Her work has appeared in the New York Times, The Atlantic, O, The Oprah Magazine, and elsewhere. She teaches at Warren Wilson College and lives in Portland, Oregon.